Climate change is still considered a controversial subject by many people, and it continues to be avoided by the mainstream news media. Some people still take an "everything is just fine" approach to the subject. They think if something was really wrong with our climate, they would hear about it on the news. Others wonder, "What's the big deal if the earth is getting 1 or 2 degrees warmer? It's not the end of the world." Multiple surveys and polls have shown that only a small handful of scientists disagree with the idea that human activity has caused global warming. A recent study of scientific research relating to climate change shows that of 13,950 scientific articles published in peer-reviewed journals between 1991 and 2012, only 24 (less than 1%) were skeptical of the concept of human-caused climate change. Last year I wanted to learn more about the possible consequences of global warming and read a 2009 book by James Hansen called Storms of My Grandchildren. Hansen is the climate scientist who originated the global warming theory and testified before congress on the subject in 1988. In reading the book, I wanted to find out the worst-case scenario of what could happen if we fail to act to stop climate change. It turns out, unfortunately, that the worst-case scenario is as bad as you could imagine. About halfway through the book I was overtaken by a sense of despair as Hansen discussed the effects of unpredictable weather on the planet's ecosystem. Plant and animal species depend on a stable temperature and climate for their survival. As the climate continues to become more unpredictable, Hansen speculates that many animal and plant species will begin to die out, and since we depend on this natural food chain for our survival, humans will also face extinction. This is just one of several unthinkable consequences. If we continue to drag our heels in response to climate change, future generations will be faced with a continued increase in violent weather events such as tornadoes, hurricanes, blizzards, and droughts. 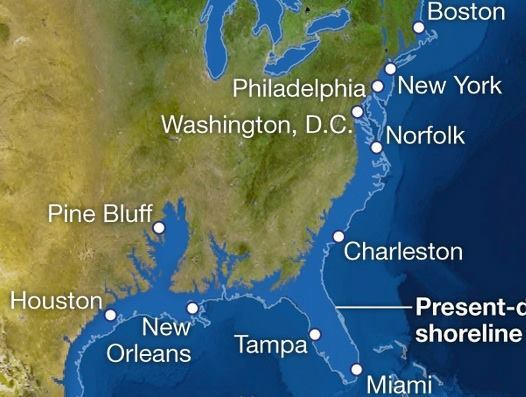 The melting polar ice will result in flooded coastal cities and a worldwide refugee crisis. Combined with the disruption of the ecosystem and food supply, these problems will most likely result in the collapse of human society into a state of extreme poverty, famine, and barbarism. Only a small fraction of our current population will survive. A projection of flooding due to melting polar ice. So what if, on the other hand, the climate change skeptics are correct in their claims that the global warming of recent times is a perfectly natural phenomenon which is unrelated to human activity, and everything will eventually return to normal? Are efforts to prevent climate change a complete waste of time and harmful to the economy? It's true that acting to reduce greenhouse gases will cause a loss of jobs in the fossil fuel industry, but these losses will be offset by new jobs in the clean energy industry. We will have a cleaner atmosphere and planet as a result. It will also solve the problem of finding new energy sources after the planet's oil and coal supply has been used up. In other words, switching to cleaner forms of energy is a win/win no matter what you believe about climate change. Clearly, the consequences of inaction outweigh the consequences of unnecessary action. Making this choice is kind of like asking, "Should I drive my car off the cliff, or should I stop, turn around, and find a safer route to where I'm going?" Are you willing to bet your life (and your family's lives) on your belief that the cliff doesn't exist? In terms of climate change, the car is now about ten feet from the cliff. The polar ice sheets of Antarctica and Greenland have already started to melt. If may seem pointless to change our ways at this point, but we have to try while we still have a chance. Politicians and governments have already taken steps toward reducing greenhouse gases, but they are not feeling the urgency that will be required to prevent the approaching climate catastrophe. For the sake of future generations we need to take immediate steps to phase out the use of coal (the largest contributor of carbon emissions) and replace it with wind, solar, and hydroelectric energy sources (and possibly third-generation nuclear technology, which is safer and cleaner than traditional nuclear power). Then we need to decrease our use of petroleum-powered forms of transportation and pursue sustainable ways to live on this planet which has allowed us all to live. Please write to your elected representatives and urge them to help replace the use of coal with alternative energy sources.